Sharif Tabebordbar is a postdoctoral fellow in the Sabeti lab. He is interested in isolating and engineering novel non-pathogenic viruses (including adeno-associated viruses) for improving viral-mediated gene delivery. Sharif is also developing high throughput strategies for detection and sequencing of pathogenic and non-pathogenic viruses. 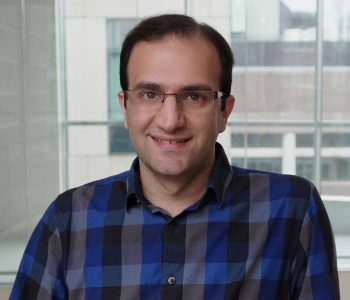 Sharif received his BSc and MSc degrees in biotechnology from University of Tehran and his Ph.D. in Developmental and Regenerative Biology from Harvard University. During his Ph.D., he developed culture conditions to expand healthy and diseased adult muscle stem cells in culture and provided the proof of concept for correcting the genetic mutation in these cells using gene editing technology. He also provided evidence for the feasibility of an in vivo gene editing-based approach to treat Duchenne Muscular Dystrophy (DMD) and investigated the host immune response after delivery of gene editing components into animals. The results of his research have been published in several peer-reviewed journals including Cell, Science and Nature Methods. Sharif is also the recipient of Distinction in Teaching Award from Derek Bok Center for Teaching and Learning at Harvard, Albert J. Ryan Foundation Award for Outstanding Graduate Students in Biomedical Sciences, Excellence in Research Award from American Society of Gene and Cell Therapy and Royan International Research Award in Regenerative Medicine. Research and Perspectives in Neurosciences. Springer. 2017. Tabebordbar M, Cheng JKW, Wagers AJ. Therapeutic Gene Editing in Muscles and Muscle Stem Cells, Jaenisch R, Zhang F, Gage F (eds). Tabebordbar M*, Zhu K*, Cheng JKW, Chew WL, Widrick JJ, Yan WX, Maesner C, Wu EY, Xiao R, Ran FA, Cong L, Zhang F, Vandenberghe LH, Church GM, Wagers AJ. *Equally contributed. Chew WL*, Tabebordbar M*, Cheng JK, Mali P, Wu EY, Ng AH, Zhu K, Wagers AJ, Church GM. *Equally contributed. Xu C*, Tabebordbar M*, Iovino S*, Ciarlo C, Liu J, Castiglioni A, Price E, Liu M, Barton ER, Kahn CR, Wagers AJ, Zon LI. *Equally contributed. Modified mRNA Directs the Fate of Heart Progenitor Cells and Induces Vascular Regeneration after Myocardial Infarction. Zangi L, Lui KO, von Gise A, Ma Q, Ebina W, Ptaszek LM, Später D, Xu H, Tabebordbar M, Gorbatov R, Sena B, Nahrendorf M, Briscoe DM, Li RA, Wagers AJ, Rossi DJ, Pu WT, Chien KR. Braveheart, a Long Noncoding RNA Required for Cardiovascular Lineage Commitment. Klattenhoff CA, Scheuermann JC, Surface LE, Bradley RK, Fields PA, Steinhauser ML, Ding H, Butty VL, Torrey L, Haas S, Abo R, Tabebordbar M, Lee RT, Burge CB, Boyer LA. Skeletal Muscle Degenerative Diseases and Strategies for Therapeutic Muscle Repair. Annual Review of Pathology: Mechanisms of Disease. 2013. Tabebordbar M, Wang ET, Wagers AJ.